Donna High's Nicole Richardson, left, and Miranda Sandoval celebrate after beating Mission Veterans in a Class 5A bi-district playoff game Monday at McAllen High School. McALLEN – Brianna Quesada had just 5.8 seconds to get off a shot. She actually took it a bit early, but that didn’t matter because the half-court heave just before the buzzer expired to end the half was nothing but net. 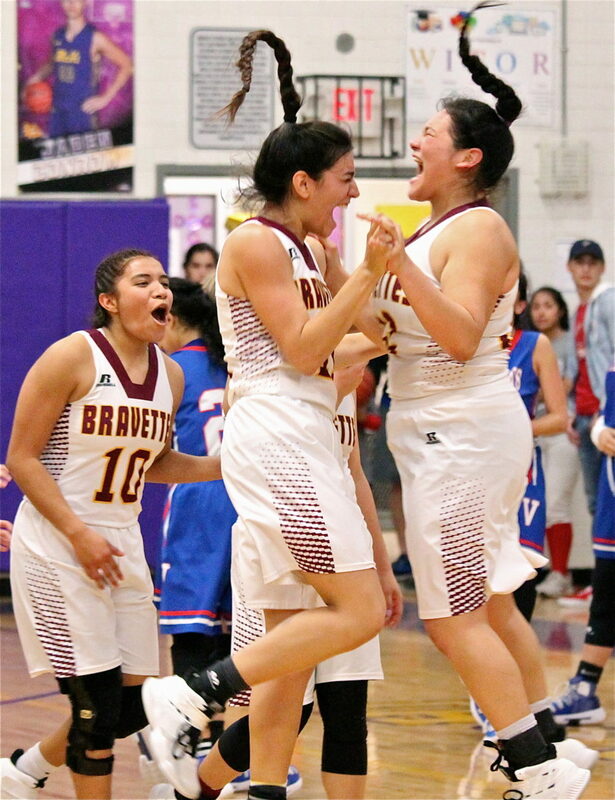 That’s how the day went for the Donna Bravettes, who jumped out to a leads of 16-2 after one quarter and, thanks to the long 3-pointer by Quesada a 30-14 lead at the half en route to convincing and lop-sided 60-38 victory over Mission Vets in girls’ Class 5A bi-district playoff action Monday night at McAllen High. The win sets Donna up with a game either Friday or Saturday against Victoria West in the area round of the playoffs. Victoria West defeated Corpus Christi Calallen in their bi-district matchup. Donna came out with an extended 3-2 zone that the Patriots had difficulty with, especially in the first half, and didn’t score a field goal in the first period, just a pair of free throws and trailed 7-1 with 3:15 remaining in that first frame. The Patriots made several mini runs and it looked like they would get back into the game, but Donna – led offensively by Quesada and Miranda Sandoval, with 24 and 19 points respectively, shut down any long runs that would close the gap significantly. While Quesada and Sandoval led the team on offense, there were big contributions throughout the day. Nicole Rodriguez got to the line for a pair of free throws and Campos, who was responsible much of the day for breaking the Mission Vets press, nailed a 3-pointer from the corner and it was already 5-0 early in the first period. Quesada and Sandoval scored all 15 points for Donna in the third quarter as the Bravettes extended their lead to as many as 22 in the period. Jackie Howell did what she could inside, scoring seven of her team high 13 points in the period. The Patriots looked to play more of an inside out game and a drive and dish game in the second half. The inside play took some shape but wasn’t enough to overcome the large deficit or Quesada driving to the basket and Sandoval dominating post play. Mission Veterans didn’t hit a 3-pointer the entire game. The time and place of the area round game for Donna against Victoria West will be decided today. Indications are that it will be played in Bishop.